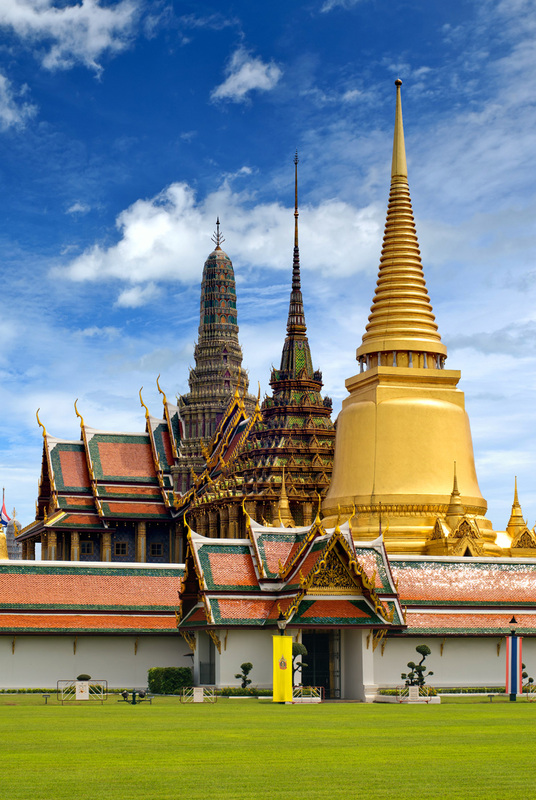 Bangkok is buzzing, humid and exotic, Bangkok is the larger-than-life city where magnificent temples, historic markets, skyscrapers and rooftop bars create an intoxicating vibe that’s hard to resist. 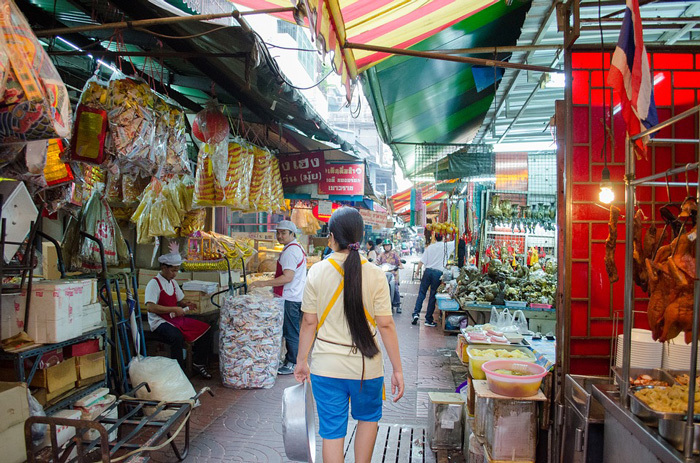 A blend of the traditional and the modern, Bangkok's every street has a surprise in store. Ramshackle buildings crouch next to striking holy shrines, which are overlooked by modern hotels and offices. The short window of winter lasts between late December and early January, and these cooler temperatures coincide with peak tourist season. November and February are cooler with (typically) fewer people. Traffic is unavoidable if in a car or other vehicle. Public transportation is rapidly improving, and the BTS (the above-ground Sky train) and MRT (underground metro) run from 6 a.m. to midnight; however, they require separate tickets and rarely connect with each other (fares for both start at $0.50). Brightly coloured taxis and tuk-tuks are available for hire for an outstanding bargain. April is the hottest month, with an average high of 35°C (95°F) with humidity adding an extra layer of heat. December is the coolest month, with an average high of 26°C (79°F). 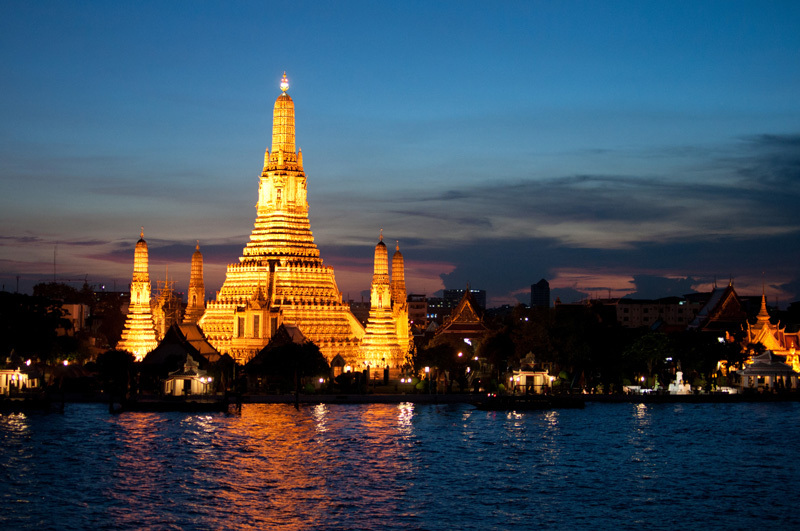 Located on the Thonburi side of the Chao Phraya River, opposite Wat Pho, is Wat Arun and its five soaring spires. Remember you can climb up to a certain point for excellent views over the Chao Phraya River, especially at sunset. This 200-year-old, Lanna-style teak house was built on the Ping River in 1848 and transported south from Chiang Mai to be reconstructed in Bangkok. Once owned by a countryside family, it has now been set up as an ethnological museum by the Siam Society. Showing the simplicity of rural life in northern Thailand during the last century, it contains a collection of traditional implements such as fish traps used by farmers and rice field fishermen. 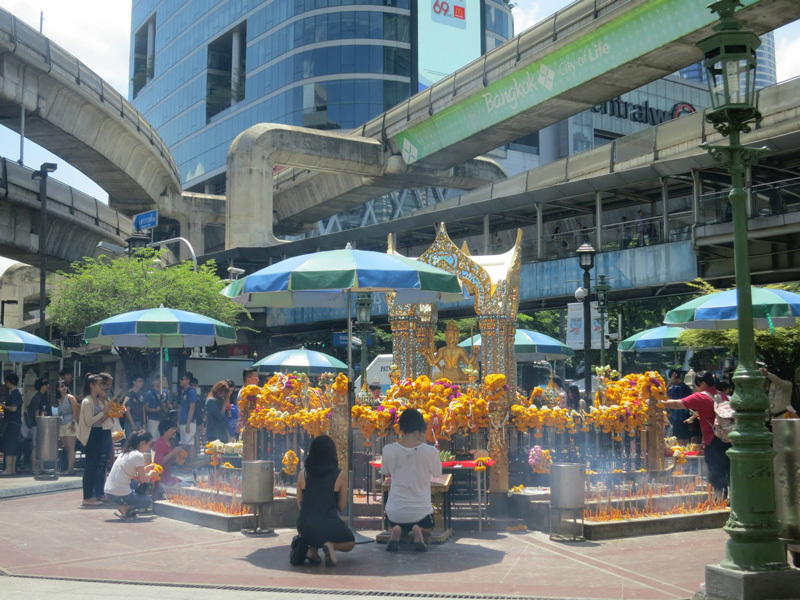 On the corner of a busy junction, opposite the Central World Plaza shopping mall in downtown Bangkok, is the revered Erawan Shrine. Thais flock to this homage to Brahma, the Hindu god of creation, and his elephant, Erawan, which looks best at night when the shrine is illuminated. There's not much green space in Bangkok but Lumphini Park (also called Suan Lun) offers welcome relief from the hustle and bustle of the city. A glittering walled complex that houses several palaces and temples, most ornately decorated with tiles and ceramics. 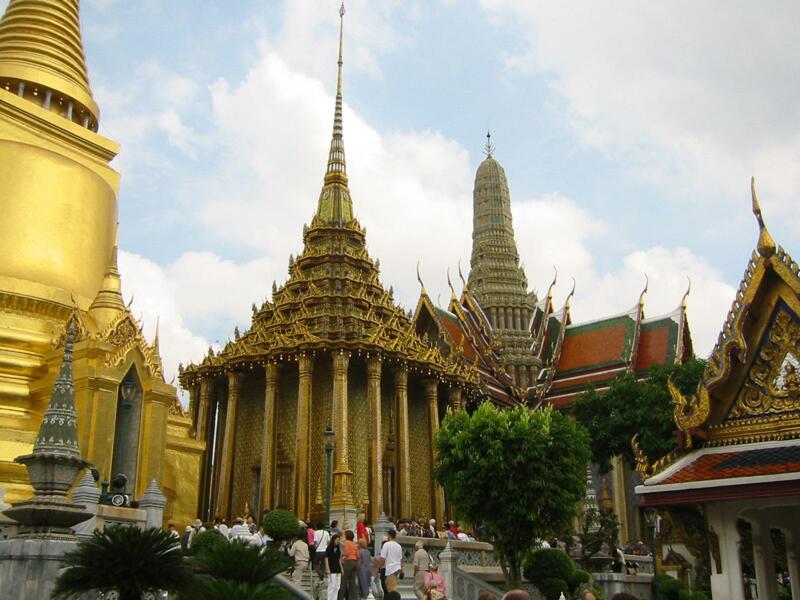 The most important spot is Wat Phra Kaeo, the holiest of all Thai temples. There is a strict dress code and visitors wearing shorts, mini-skirts, sleeveless shirts or flip-flops will need to hire trousers and plastic shoes at the entrance. 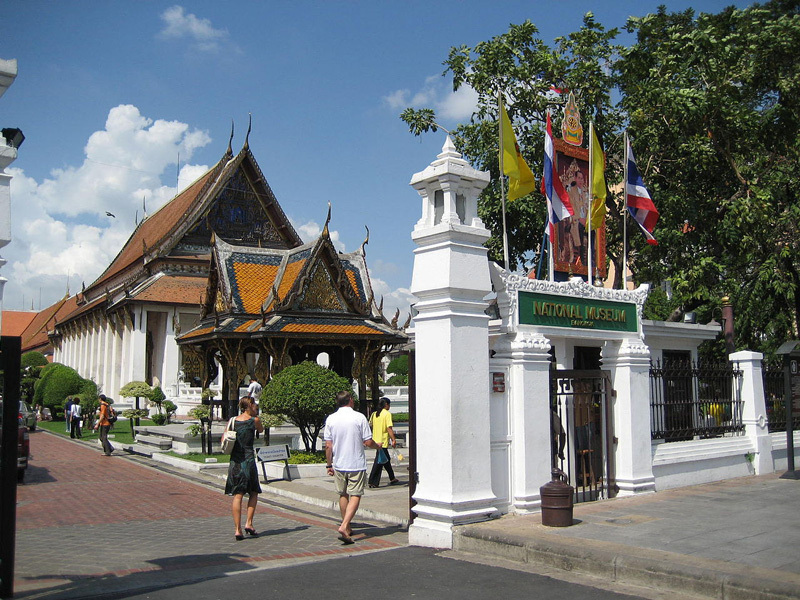 One of the region’s largest and most comprehensive museums, Bangkok’s National Museum houses a vast collection of artefacts from the Neolithic period, royal funeral chariots and the Phra Sihing Buddha in the ornate Buddhaisawan chapel. Free guided tours in English are led by volunteers at 0930 on Wednesdays and Thursdays and are highly recommended. 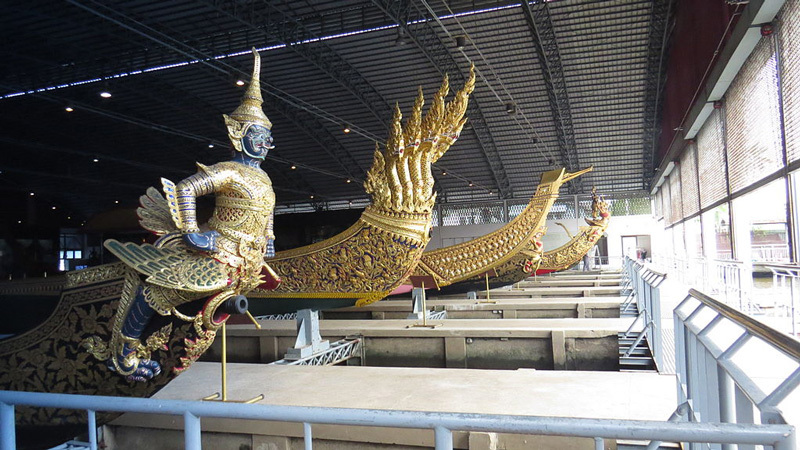 Rarely used by the royal family these days, several historic royal barges are now preserved in the Royal Barges National Museum on the Thonburi side of the Chao Phraya River. The eight narrow boats on display are intricately gilded and each need between 50 and 60 rowers to take their oars. 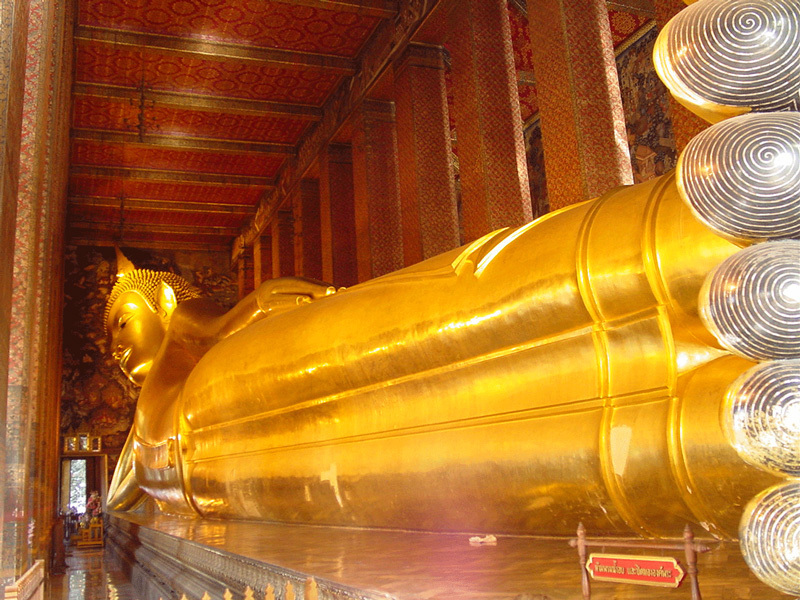 Wat Pho is Bangkok’s oldest temple, dating back to 1688 and the reign of King Petraja of Ayutthaya. Note the dress code: no shorts and shoulders should be covered.Visitors can wander amongst the peaceful rock gardens, chapels, cloisters and stupas. The temple is also renowned for its teaching of herbal medicine and visitors can book traditional massages at its Thai Traditional Medical School. 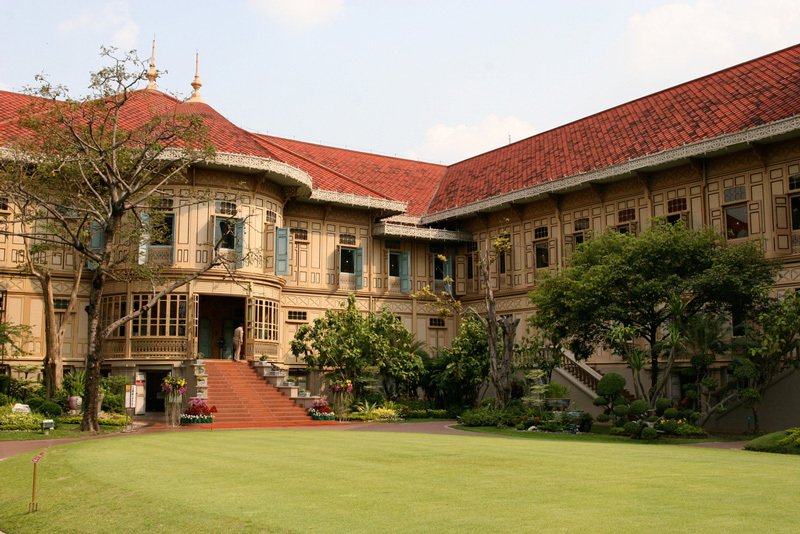 The former residence of Prince and Princess Chumphot, one of Thailand's leading art collectors, Suan Pakkad Palace contains a host of their art and antiquities passed down the generations. Vimanmek Palace is the world's largest building made entirely of golden teak. The 81-room mansion stands in carefully manicured lawns and is located close to the current royal residence with 31 exhibition rooms containing Thai art and artefacts from ceramics to silverware. Guided tours are the only way to see inside and take place every 30 minutes. Admission Fees: Yes (included with ticket to the Royal Grand Palace). 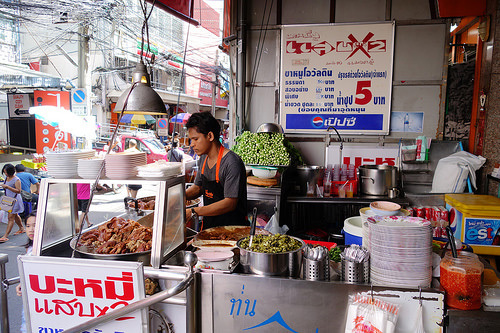 Bangkok’s Chinatown known locally as Yaowarat, is a great place to sample some street food, and is arguably Bangkok’s street food centre. 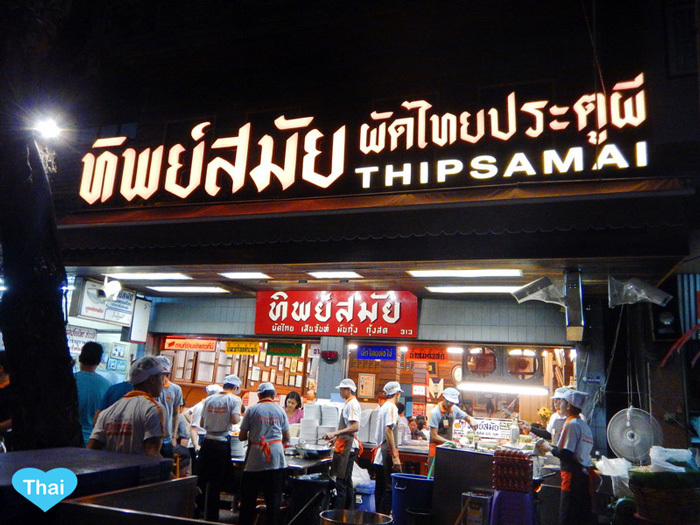 Along the Yaowarat road, enjoy the smells of the street stalls and small restaurants serving up delicious food. Try many different types of foods from both Thai and Chinese dishes, but make sure to only sample small portions, as there is so much to try and taste. Barbecued seafood is very popular here, as is flat noodles in pepper broth, barbecue spears with peanut putter, crispy duck and curries of many different kinds. Open all day, but best in the evenings. Not to far away from Yaowarat (china town) is little India where you can try many different kinds of Authentic Indian Cuisine. If you are staying near Silom then Bangrak is a cool and hip little place with excellent Thai food. 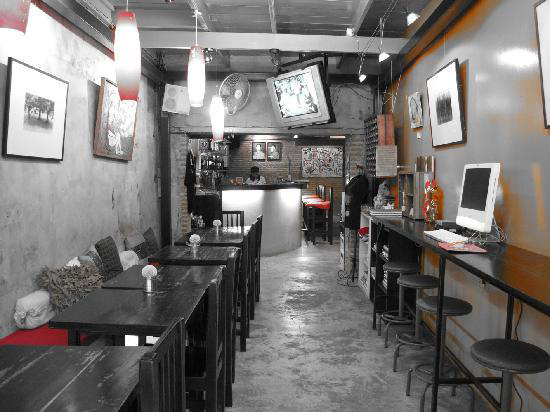 The place has a nice and relaxed atmosphere, with live music and even an art exhibition every now and then. Check out there smoothies, shrimps wrapped in crispy bacon and chicken wings. One of the best Pad Thai restaurant in Bangkok and worth a trip to taste not only the fresh and flavoursome food but the amazing orange juice. Pad Thai is a common street food in Bangkok and in local eateries and is a essentially stir-fried rice noodles. If you’re in Bangkok and want a taste of home check out the most popular American dinner, the Smoking Pug American BBQ. 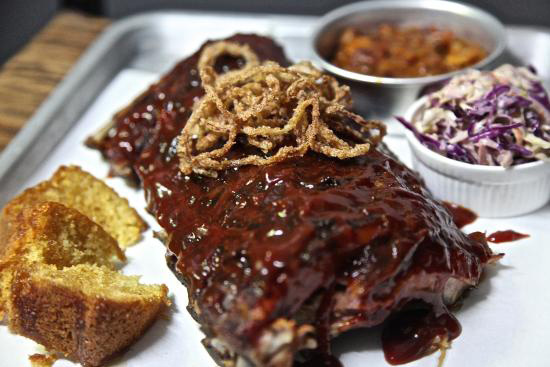 Known for its succulent baby back ribs and pulled-pork chilli it is a must when in Bangkok, also check out the cocktails as they mix well with the smoky barbecue taste. Somboon Seafood has many branches across Bangkok but most conveniently accessed is the branch located on the 4th floor of Siam Square One. Somboon can get quite busy so be sure to book if you are going to come here. The main dishes to try are the succulent Curry Crab and the Crab fried rice that both work very well together and is a must when visiting Bangkok. Address: SabX2 Wanton Noodles, 4/32-33 Soi Petchburi 19, Pratunam. For the ultimate burger check out the Daniel Thaiger Food truck, known arguably as the best burger in Bangkok for the price and people come from all over Bangkok to get a taste of this succulent beef or pork burger. Although food trucks in Bangkok are normally on the back of a motorbike Daniels Burger truck would put you in the mind of an American food truck dropped in the middle of Bangkok. If your coming to Daniels expect to queue and make sure to check the Facebook page before coming as food normally sells out quite early. 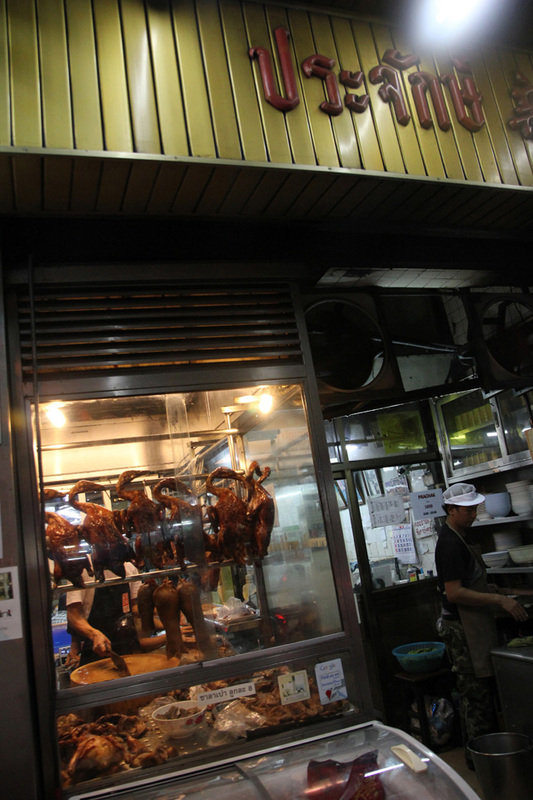 Roast duck is commonly found throughout Bangkok, especially in the heavily Chinese influenced areas and Pratchak Pet Yang is is one of the most famous of the selection. A legendary Cantonese style duck restaurant located right along Charoen Krung road, opposite Robinson’s department store. Check out the Roasted duck and rice. Located on the 39th and 40th floors of the mammoth Sathorn Square Building the views are fittingly impressive, with an endless cityscape from the nightclub section and views to the Chao Phraya River and beyond from your dinner table. Ce La Vi Bangkok includes two restaurants, a central cocktail bar and glamorous nightclub, which is best labelled a lifestyle destination. The grand idea is to wrap up a night out all within one sophisticated space, hopping from restaurant to bar to club. This classy electronic nightclub with a view is located up on the 6th floor of the chic Aloft Hotel, and is now the place to be seen and party in lower Sukhumvit. There is plenty of house music being played here, but Levels excels in its DJ's, bringing in some of the top international acts from around the world to rock the house. There is a large dance room here with a giant LED chandelier overhead, and then there is a club zone that features a great sound system. 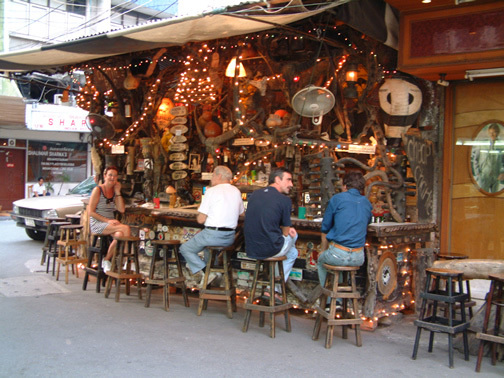 There is also a terrace bar that looks out over all the Sukhumvit neon and gives you a chance to catch your breath. 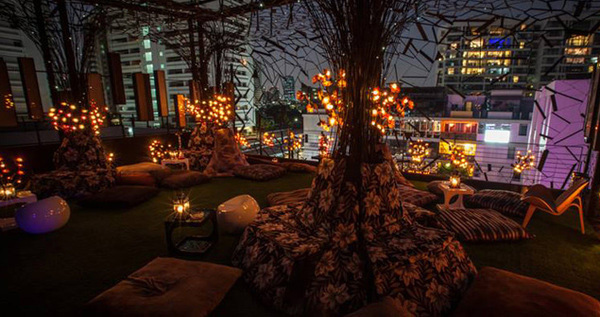 whether you’re in Bangkok for clubbing or just to relax on a nice rooftop with some tasty cocktails Grease has it all. It is has become one of the hottest spots for both Thais and Tourists looking for a good glamorous party. The main Club is called LSD (Light and Sound Demolition) playing everything from house, techno, drum&bass, dubstep, future garage, funk and electro. Grease also has a rooftop Shisha bar, Thai fusion Restaurant and chic bar. The cocktails here are astonishing as is the wine as the owners owns a fine French vineyard. 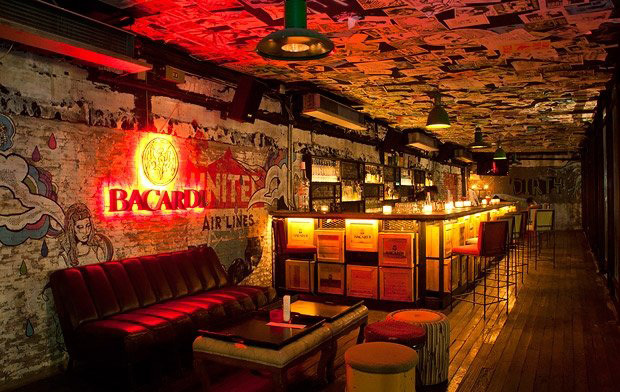 Located in and old warehouse and covered in Graffiti is a hip looking bar that is taking Bangkok by storm. Demo also adjoins to Funky Villa, a late nightclub which is perfect for partying until late hours. In demo there is a five page drinks menu with amazing cocktails but Demo can get quite pricey so bring the credit card or drink before hand in a cheap Thai bar then come here to enjoy the glam. The Q Bar has long been known throughout Bangkok and outside of Thailand for its outstanding list of touring DJ's who grace the house week in and out with their thumping dance floor choices, ranging from hip hop to electronic to all the latest grooves. The club features a spacious terrace along with its large dance floor, and some well trained mixologists behind the bar. For something a bit different check out the Game Over Lounge. 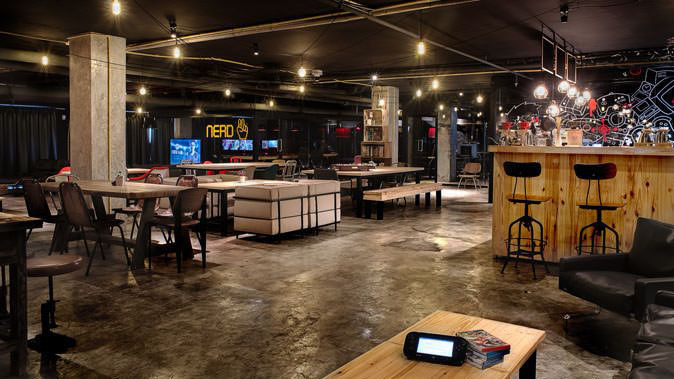 Whether you’re into board games, video games or just enjoy a bit of fun, Game Over lounge has it all. Enjoy a night out with fun and excitement and well-priced craft beers, smooth milkshakes and delicious cakes. The best attraction here though is not the games but the Daniel Thaiger Burgers served every night. Located on the waterfront at the Thien Pier, this cosy bar has an amazing view over the Wat Arun temple. Perfect to catch a cheap drink during the sunset as this bar doesn’t charge a premium for the view like many other Bangkok bars. There’s no front door, no bathrooms and no roof, but who needs all that in a bar? Cheap Charlie’s keeps it to the essentials, serving ridiculously cheap booze to a few barstools with a almost quirky decor. Airlines offering flights to Bangkok from the UK include Thai Airways, EVA Airways and British Airways. There are no non-stop flights from the USA; you need to include at least one stopover. Flights are expensive during the peak season from November to March. Cheaper flights are available during the low season in May, June and September. From London - 11 hours 30 minutes; New York - 20 hours (including stopover); Los Angeles - 18 hours (including stopover); Toronto - 19 hours 20 minutes (including stopover); Sydney - 9 hours 25 minutes. Bangkok Transit System runs Bangkok's efficient monorail, the BTS SkyTrain. Two lines operate daily, connecting popular spots like Chatuchak Market and Siam Square. You can buy single-journey tickets and one-day passes at station vending machines and ticket offices. Or you can buy a reloadable Rabbit smartcard, which you can also use on BRT (Bangkok Rapid Transit) buses (but not the metro). 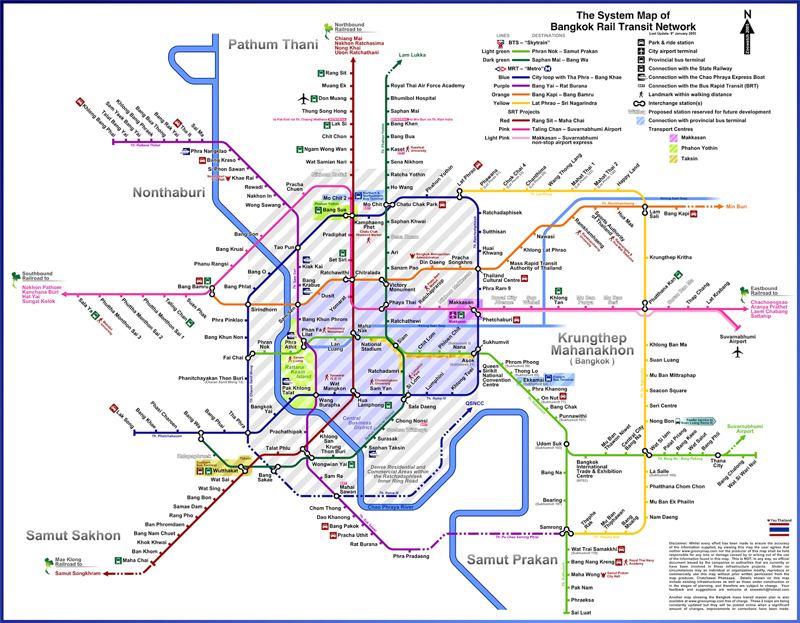 The Bangkok Metro has 18 stations. Starting at the main railway station, Hua Lamphong, it connects with BTS trains. You can buy single-journey tokens from station vending machines or use the Metro's own reloadable smartcard for multiple journeys. One-, three-, 15- and 30-day passes are available. The BRT is a bus rapid transit system running along one line, from Chong Nonsi Skytrain station to Talat Phlu station. Rabbit cards are valid on this service. You can hail taxis in the street, but check that the meter is turned on. In unmetered taxis, you must agree the fare before setting off. Passengers pay for tolls, so ensure you have small change.Tuk-tuks are another way of getting around town. These three-wheeled taxis ply the streets and are ideal for short journeys. You must negotiate fares before getting in. Motorcycle taxis are popular and easy to spot as drivers wear brightly coloured vests. It is compulsory for passengers to wear helmets so check the driver has one. *Uber is also available in and around Bangkok and is a great alternative than Taxi’s. Click here for your first journey free. It’s generally not advisable or necessary to drive around Bangkok due to heavy traffic and tricky navigation. For those who wish to, many of the large shopping complexes and hotels have a car park. Tolls are payable on some motorway routes. Bangkok offers a bike-share scheme called Pun Pun, which operates, from around 50 stations in and around the city centre. Navigating Bangkok’s traffic can be daunting for novice riders but guided bike tours offer reassurance for the less experienced. Passport and deposit are required. -When in Bangkok you will notice that there isn’t many barcodes or set prices on many items. So get haggling/bartering, its expected. Aim to chip anything from 10-40% off the quoted price and walk away if the price is disagreeable- often they will call you back for a last negotiation. -Beware of the many scams around Bangkok that try to get you to give over your hard earned cash. Beware of the Tuk Tuks that want to stop off at any gem stores, also be aware of taxis with no meters running. -Whether it be an impromptu demand from a local policeman or a request from security at one of the city’s swanky nightspots, carrying ID is a must in Thailand.proving who you are is a day-to-day formality, something the Thais are finicky about. Instead of dragging your passport around with you, and with it the constant fear of losing it, take a photocopy. -Carry round a card with your hotel/accommodation address on it in Thai can be a life saver when trying to get home at any time. I don't even know how I ended up here, but I thought this post was great. I do not know who you are but definitely you are going to a famous blogger already ;) Cheers!